Don’t miss the next installment of the USA Today bestselling romantic comedy series and find out what happens when the whole town thinks Fallon Hartigan slept with the most hated man in Harbor city. Add Tomboy to your Goodreads shelf! 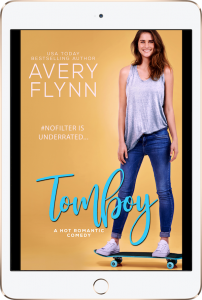 Enter to WIN an advanced digital copy of Tomboy by Avery Flynn!